Pictures say a thousand words. Videos say a hundred thousand words. And a particular video game just might reveal the exact right amount of detail that could render someone speechless. The fire in Notre Dame Cathedral has brought us together, evidenced by the staggering $1 billion that’s been raised this week for rebuilding the famed Parisian church. The world was watching this past Monday in horror as an inferno engulfed Notre Dame — which was particularly devastating for those witnessing the fire in person — and in addition to saving priceless works of religious art and relics, the architectural struggle begins to restore the church. Surely there are several traditional reference points to assist in this incredible task. But what about untraditional sources of information? What if there is a high-definition, digital record of Notre Dame’s intricate Gothic architectural beauty that is discoverable by the title ‘Assassin’s Creed Unity’? Your son or nephew may possess a helpful key to rediscovering Notre Dame’s past for the future. The intersection of popular culture in the form of film, TV and video games with real-world situations/reality is just getting busier by the day. Recall the dedicated interest of Christopher Nolan and Co. to work with famed American theoretical physicist Kip Thorne to visually create a black hole for the 2014 science fiction film ‘Interstellar’ that turned out to be pretty damn close to the first image of a black hole in space. Now a video game could assist in rebuilding Notre Dame Cathedral. While I’m not surprised by this revelation, I am nonetheless at a slight loss for words in happiness that a video game can help restore Notre Dame Cathedral in 2019. Engulfed by a massive fire just days ago, Notre Dame Cathedral’s structural survival for rebuilding efforts appear evident and the survival of its priceless relics are being accounted for with dramatic precision. 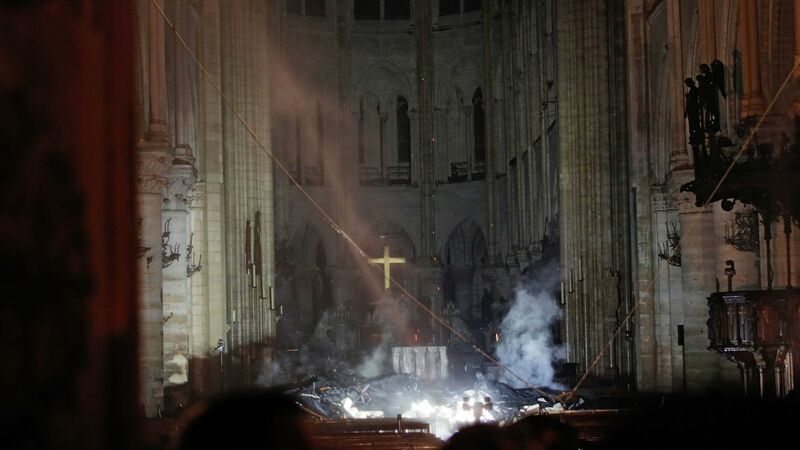 Thanks to Paris Fire Brigade Chaplain Jean-Marc Fournier, arguably the most sacred relic was saved from the inferno. Whether in the burst of bravery for Jean-Marc Fournier or just the fortunate, salvageable location for rescue — or a combination of the two — saving the Crown of Thorns prompts an immeasurable sigh of relief and thankfulness in equal measure for millions of people around the world. For a more in-depth look into the history of the Crown (or Helmet) of Thorns, watch Morgan Freeman speak with a curator of the crown in Notre Dame from earlier this year. Notre Dame Cathedral will rise again and it will do so with its irreplaceable, spiritually inspiring crown for-the-ages. The 8-seed Columbus Blue Jackets swept the 1-seed–and Presidents’ Trophy-winning–Tampa Bay Lightning in four games in the first round of the 2019 Stanley Cup Playoffs. Game 1: A 3-0 deficit was erased with a stunning Blue Jackets 4-3 comeback win. Game 2: Columbus destroyed Tampa Bay 5-1 in Florida. Game 3: The Blue Jackets won 3-1. Game 4: Watch below to relieve the dramatic, magical night inside Nationwide Arena in Columbus, OH-IO on Tuesday evening. Was last season’s four-game collapse against the favorited Washington Capitals the odd springboard for the Blue Jackets playoff success thus far in 2019? That’s probably a safe presumption, specifically when discussing the third game in this series. More broadly, Columbus has arrived in a way this city has been waiting around two decades to witness. something they don’t want to face-off with anytime soon.